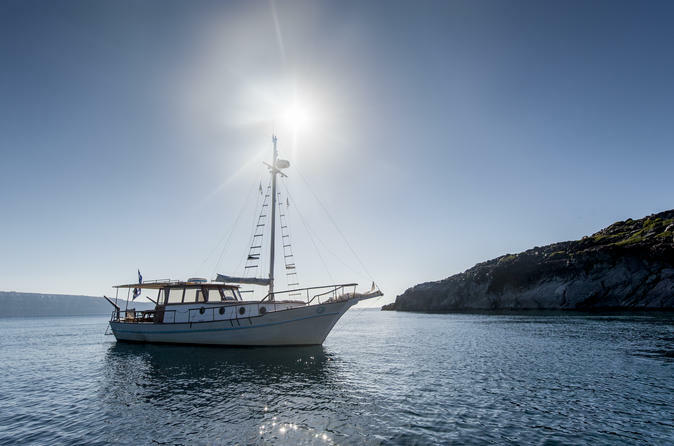 Revel in Santorini’s beauty aboard a traditional 'caique' sailboat on this relaxing 5-hour cruise. Relax on the pretty wooden boat and admire the wonderful scenery as you sail around the caldera past sheer cliffs, islands and beaches. Stop to bathe in hot springs, swim and snorkel at Red Beach, and marvel at the views of shimmering white Fira, Imerovigli and the southern lighthouse, perched high on the clifftops. Enjoy unlimited drinks and a tasty lunch on board, and afterward, choose to visit Oia to experience its famously beautiful sunset views.